When the Amazon CEO Jeff Bezos mentioned that he was keen on tapping the potential of fashion industry in India barely two weeks ago, not many would have thought what he had up his sleeve! Bezos had also promised to invest $2 billion in India during that visit. Fashion is the second largest category in online retail in India, accounting for almost 25% of the online sales, second only to Food and Grocery which make up 60% of the total sales. Amazon had adopted a similar strategy for pushing up its share in the US fashion market in 2009 by acquiring Zappos. It is said to be eyeing the UK – based fashion portal Asos as well. If Amazon wants to spread its wings in Asia, India is going to be vital to its fortunes. Though China is a huge market if we take into account the sheer numbers, the undisputed king in that region is Alibaba which looks unconquerable. Jabong seems to be the ideal choice for an acquisition after the largest fashion portal Myntra was acquired by Flipkart for a whopping $370 mn though nothing can be confirmed at the moment. Rocket Internet has estimated the net worth of Jabong to be $500 million (Rs 3,000 crore) but experts suggest it is worth much more and could easily fetch upto $700 million (Rs 4,200 crore). Currently, Amazon’s biggest rival in the online retail market in India is Flipkart. Earlier this week, Flipkart’s big-billion-day fiasco indirectly benefitted Amazon hugely though the response to their own much anticipated Diwali-dhamaka today has been lukewarm, to say the least. India is seen by online retailers as one of the most rapidly expanding markets and is expected to touch Rs 50,000 crore by 2016 as suggested by CRISIL. Together, Flipkart and Myntra account for more than half the sales in online fashion retail. When contacted for confirming the rumors of the ongoing acquisition, both the parties in question preferred to keep their cards close to the chest. Amazon said it does “not comment on anything we may or may not do in the future”. Jabong did not reply to emailed questions. If Amazon does indeed plan to reap huge profits from this most promising section in Indian online retail, the future of fashion industry looks bright indeed. Apart from constituting a huge percentage of total online sales, the profit percentage in the fashion industry is around 35%. A very lucrative market indeed. Besides that, the sales in online fashion retail have been picking up very fast. Jabong’s sales figures in this section touched an astounding Rs 509.5 crore this year. An increase of almost 300% as compared to the previous year. Even more encouraging is the fact there has been an increase in the number of unique visitors to the site. And people from Tier II and Tier III have also been seen buying online, in a clear departure from the earlier trends. Most people from smaller cities have conventionally been wary of buying online. With many big players also wooing Jabong at present, it would be too early to start guessing which way the ball will finally roll. The future of online fashion retail in India has never been brighter. What we can confidently predict, however, is that the deal (if at all) is going to be a complicated one. The stakes are high and it is still too early. Investment of $2 billion in India by Amazon is really a great news. 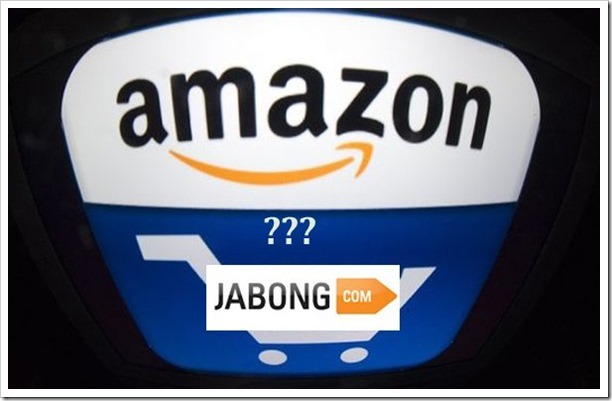 Jabong and Amazon together can rule India in Fashion and other thousands of products.